Susie: "I had to make a claim and it was so quick and so easy. What impressed me the most was the staff really cared." Learn more about how easy it is to make a claim with Bought By Many. "This is my second claim for a dental condition on our 1-year-old Springer spaniel and yet again the claim process, service updates and prompt approval is first class! Have recommended to all my doggy friends and so glad I found them! As a financial adviser I was particular when searching for insurance and for once when I thought it was too good to be true, I was proved wrong! It is so good & it’s true!" Jacqui: "Bought By Many was the only company that offered no-excess!" Our TV ads feature The Sooty Show's Sweep and his journey of finding out about Bought By Many from his friends Diesel, Doris and Oscar. See them all here. 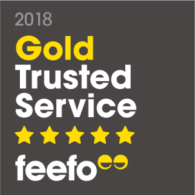 Read more customer reviews on Feefo. We've received more than 4,800 5-star reviews in the past 12 months.